Brilliant pale silvery straw color. Fruity, floral aromas and flavors of peach sorbet, mandarin oranges, and lilacs with a silky, effervescent, off-dry medium body and a smooth, interesting, medium-to-long finish with notes of peach skin, spiced apples, and lemon sorbet. A very tasty, easy drinking bubbly that’s perfect for the patio. Bottom Line: A very tasty, easy drinking bubbly that's perfect for the patio. Sparkling wine covers many countries, grape types and quality levels. What all of these wines have in common are bubbles. How the bubbles get there define the type and quality of the sparkling wine. The most famous sparkling wine of course is Champagne, from the eponymous region in France. These are made by what is known as the Champagne or "classic" method, where the secondary fermentation that produces the sparkle is done in an individual bottle. 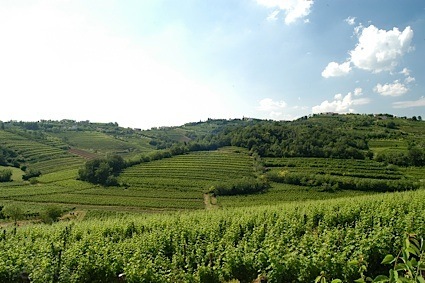 Other sparkling wines that use this method include Franciacorta and Alta Langa in Italy as well as Cava from Spain. Other sparkling wines are made when the bubbles (or carbonation) is created in large tanks. While there are many inexpensive, simple sparkling wines made in this method, there are some excellent examples, most notably Prosecco. Sparkling wines in many cases are meant to be drunk upon release, although the best examples of Champagne can age well for more than a decade. As sparkling wine is celebratory in nature, it is often used for toasting a special event, such as an anniversary or birthday. Yet the finest dry sparking wines work beautifully with a huge array of foods. These wines are arguably the finest food wines in the world. 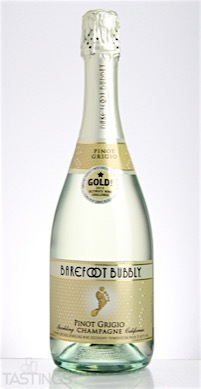 Barefoot Bubbly NV Pinot Grigio, California rating was calculated by tastings.com to be 88 points out of 100 on 7/8/2016. Please note that MSRP may have changed since the date of our review.